Recent advances in Honda technology features have set the current lineup of vehicles available at Hampton Roads Honda Dealers even further ahead of the competition. 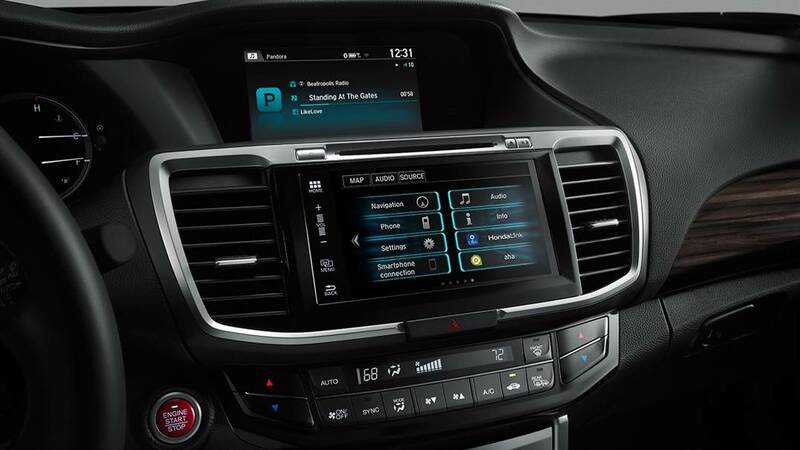 Amenities like Apple CarPlay and Android Auto connect your smartphone seamlessly with the infotainment system, HondaLink takes telematics to new heights, and Honda Sensing features help make Honda vehicles even safer. We think the best way to show off these new tech features is to put you behind the wheel so you can experience them firsthand, but in addition to looking at competing cars’ tech offerings (like our review of 2016 Toyota Corolla technology), we have an overview of what each of these pieces of Honda tech does for a new vehicle. Bluetooth has been available in cars for years now, but it’s only been recently that it could do more than take care of phone calls. Many drivers know the struggle of a phone and a car simply not getting along, but that becomes a thing of the past with features like Apple CarPlay and Android Auto, optimized for the most popular smartphones on the market. Apple CarPlay is designed by Apple to make the connection between your Honda and your iPhone as intuitive as using one of their computers or tapping an app to open it up on your phone. Use familiar apps like maps, messages, music, and phone just like on an iPhone. CarPlay also brings Siri Eyes Free wherever you go; just speak a command and Siri answers. Android Auto connects with an Android phone, any Android phone, and brings your favorite Google and third-party apps to the Honda infotainment system, including Hangouts, Spotify, Pandora, NPR, Skype, and Google Maps. Just say “OK Google” and the system is ready to load up whatever you need. You’ll find Apple CarPlay and Android Auto on new Honda vehicles with a Display Audio touchscreen interface, like Accord EX and Civic EX (and higher) trims. App Launcher: This application tells your phone to start using the HondaLink system and puts you in touch with all of the different apps you can use behind the wheel, from Connect to Navigation to Aha and more. Connect: While the App Launcher gets you started, Connect brings the future to the modern era with maintenance reminders, automated maintenance scheduling, a built-in owner’s manual, and much more. Features like local weather, points of interest, and destinations come through Connect as well. Aha: You don’t have to ride in silence ever again with Aha by your side. Cue up audio books, podcasts, radio stations, and more; this app can even read your Facebook and Twitter feeds aloud to keep you updated on social media. Navigation: Take the guesswork out of getting from point A to point B with the Navigation app; take the fastest route or find points of interest and restaurants along the way. HondaLink can be found as an available feature on many new Honda models, from the Civic to the Pilot. In addition to the standard and available connectivity features of the lineup, Honda technology offers new kinds of safety with the Honda Sensing system. Adding onto features like traction and stability control and the standard multi-angle rearview camera, Honda Sensing is a collection of driver assistance and accident prevention features that can be added onto select new models. Lane Departure Warning: This safety system looks at the markings on the road and notices if they start to move left or right, indicating that you might be drifting. If it senses a potential lane departure without signaling, it will give you an audio and visual alert to bring your focus back to driving. Lane Keeping Assist: Sometimes the warning of the Lane Departure Warning system isn’t enough, and if your Honda notices you’re moving away from the center of the lane, it can give you a nudge back to where you belong. Road Departure Mitigation: Active at speeds of 45-90 mph, this safety feature keeps you from drifting to the shoulder and off the road, vibrating the steering wheel and even adjusting torque or brakes to keep you from going off-road. Adaptive Cruise Control: By using radar technology, this system monitors the speeds of vehicles in front of and behind you to automatically adjust cruise settings so you don’t have to start and stop cruising to adjust speed. Forward Collision Warning: Those same radar systems for the Adaptive Cruise Control system keep an eye on the car in front of you and whether it’s getting too close. If it senses a possible collision, this system issues a warning before signaling the Collision Mitigation Braking system. Collision Mitigation Braking: This is your Honda’s last attempt to avoid an accident; if it senses you haven’t responded to a possible collision, it can apply the brakes to slow or even stop your vehicle. Honda Sensing amenities are available on every trim of the Civic and Accord while CR-V and Pilot models have the features available on select trim levels. For an idea of how the latest Honda technology compares to a competitor, we have a review of the 2016 Toyota Corolla that pits it against the Honda Civic. See for yourself what sets these two small cars apart. If you have any questions about the latest Honda features or want to see what these new tech amenities are all about, stop by a Hampton Roads Honda Dealer near you today for a test drive.